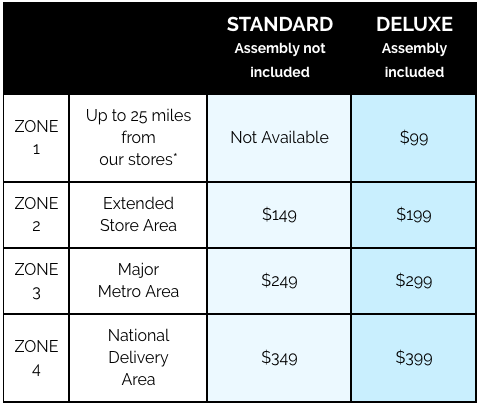 Online and in-store availability may vary by product. Contact the store closest to you for local availability. Simple, clean design gives the Pasadena collection a crisp, contemporary look. Made of New Zealand pine and veneer with a smooth protective lacquer that further enhances its timeless appeal. *Queen and Full beds pictured. *Some exceptions to the 25/50 mile radius do apply. Standard Delivery – Your furniture will be delivered to the first room inside your home's entrance. Assembly is not included. Unlimited items, one flat rate. Deluxe Delivery – Furniture will be unboxed with packaging removed from your home. Furniture will be placed in your room of choice. Assembly on most items is included. * Unlimited items, one flat rate. **Certain items include an additional assembly fee. Applicable assembly charges are noted on product information pages and during checkout. *Prices and availability subject to change without notification.